Originally posted on 08/12/2015 at www.socialistworld.net, website of the Committee for a Workers’ International, CWI. Martin Coiteux, the president of the Treasury Council of Quebec, declared last November 18: “We [the government and the Common Front movement] are light years apart in our understanding”. Less than a week later, Coiteux abandoned the majority of the attacks. The workers have displayed their strength with 3 days of strikes, blockades and occupations throughout Quebec. Just last week, Coiteux was forced to cancel two presentations, blocked by workers who prevented him access. This mobilization has succeeded in forcing the government to throw its attacks under the rug. As a result, all the government’s proposed measures that threatened conditions of work and union organizing have been retracted. This announcement was made shortly after the Common Front postponed three days of national strikes scheduled for December 1, 2 and 3; and in the context of a poll showing popular support for the rejection of austerity and for the unions. Two important issues remain to be settled: retirements and salaries. The government wants to settle without spending a penny, but the Common Front’s mandate is to stop the impoverishing of public sector workers. Our purchase power has not matched cost of living increases for the past 10 years. Though the government recently demonstrated a willingness to increase our salaries, it wishes to finance this with our retirement funds. Therefore the question is: how far are the union leaderships willing to compromise? There is no reason to cut pensions: the funds are fully capitalized. If the government proves stubborn, the union leaderships would undoubtedly prefer a special law, decreeing new changes, in order to avoid incurring the wrath of its rank and file. After all, the rank and file has been asking its leadership for nearly a year now how it plans to respond to a special law, a question that goes unanswered. In this case, either the government risks letting things drag on, or it imposes a special law to decree our work conditions. However, in the latter case, it takes a risk: several events have made it unpopular. Budget cuts are increasingly decried by citizen groups. A recent poll showed that 64% of Quebec people believe their government does a “poor job of managing” its negotiations [with labor], with only 28% supporting it. The Quebec Statistics Institute validates the union movement with respect to the decline in buying power of workers’ salaries. If it declares a special law, the government may be throwing oil on the fire, as happened in 2012, when pressure from the people forced the government to hold an election and cancel the law. What to do in the event of a special law? Strikes, blockades and occupations! Both the regional council of the Fédération des travailleurs et travailleuses du Québec (Workers Federation of Quebec), and a student association (where an AS member was invited to speak about the public sector negotiations) adopted the CCMM resolution as well. The goal is to avoid demoralizing the movement in the event of a decree. The question now is how to determine what direction the struggle should follow. On this issue, the rank and file is divided. One section of teachers is pushing for adoption of an open-ended general strike in the wake of a special law. We support this courageous position. However, by doing this, the left wing of the union base would risk isolating itself from the Common Front and going it alone. This attitude reminds us of the failure of the student movement last spring where a minority’s objective was to be as radical as possible, even at the expense of alienating its base. The student movement has not yet recovered from this and is not playing a significant role at the moment. While we must defy a special law, we must do it all together. 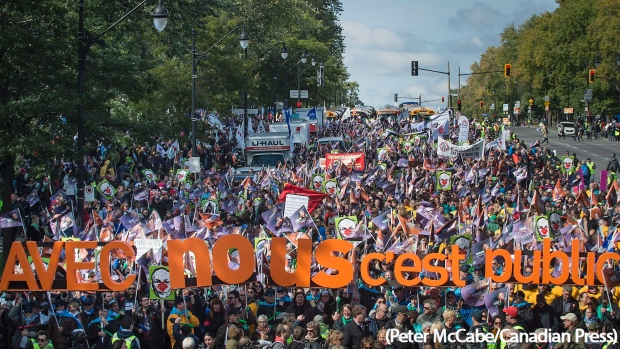 The National Teachers’ Federation of Quebec, which includes all the CEGEP teacher unions adopted a mandate claiming that, in the event of a special law, continuing to strike is “an act of legitimate disobedience”. The federal council of the Federation of Health and Social Services workers which numbers 130,000 in the health sector strongly rejected the idea of an unlimited, general strike, but nevertheless voted for 10 additional strike days: thereby clearly demonstrating its will to continue the struggle. Unfortunately, there have not been any strategic discussions with respect to adoption of a special law. In addition to supporting the adoption of the 10 strike days, Alternative Socialiste recommends that the same strike days be converted to “illegal” strike days – defying any decree – or at least into days of national disturbance by organizing occupations and blockades against the political and economic elite to thereby demonstrate that the government, whatever its strategy, will not stop us. For a decent salary, employment and retirement for all! For free and excellent public services! A moratorium on all cuts in public services! For a public system run democratically by the workers and their communities! Let’s fight to end tax havens, impose stiff taxes on the rich and nationalize the banking sector under democratic control! For a government that serves workers’ interests, not banks and big corporation!